In 2001, “Spinna-Bill & The Cavemans” was formed with the goal to create a melody-oriented reggae sound that incorporates musical ideas from various genres such as soul, R&B, funk, and Brazilian music. 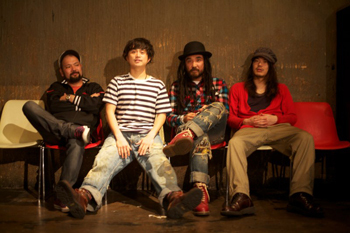 Although the band performed at “FUJI ROCK FESTIVAL” in 2002, shared a stage with HORACE ANDY in 2003, performed at the biggest reggae festivals in Japan such as “Japan Reggae Festa in Okinawa” and “Yokohama Raggaesai” in 2004, and made a name for themselves as being one of the biggest Reggae group in Japan, the band’s career ended in 2005. The band, however, made a comeback under the new name “The Cavemans” along with bringing in the likes of Ring (ex. VoVo Tau), KEEN (C&K), AIGE and Lizz as vocalists during live performances, alongside releasing their new instrumental cover album “The Covermans”. Their activities since the reunion has opened up new doors from the band. In the beginning of 2010, ID (guitar) became hooked to the voice of solo singer “AKIYUKI”, and began working on demos with him immediately. Upon when the other members listened to the finished product, they all agreed to welcome him as the new vocalist for “The Cavemans”. The goal of creating diverse reggae music that incorporate elements from various musical genres, to this day, still lives on. We must pay close attention to them.